Measuring your bike in inches, not centimeters, is a prerequisite for this kit. These kits don't come in metric sizes. It's SAE, man. That's Standard American Equivalent -- in case you've ever wondered -- for working on American-made motorcycles, standard or not. 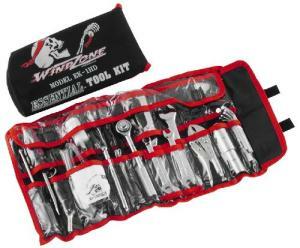 You get a fair pile of tools with the Windzone Essential. Included are the two types of screwdrivers in two sizes, open-ended wrenches ranging from 3/8" to 3/4", a 3/8" drive ratchet with 5/8" and 13/16" spark plug sockets, nine hex keys, a seven-piece torx set, and a pair of locking pliers. Some of the thoughtful touches are: a shop towel, some extra electrical wire, a small roll of electrical tape, a flashlight, a siphon hose, a spare taillight bulb, and more. Its total of 24 items fit into a plastic roll-up that Windzone claims will fit in most fork bags. This kit does contain one concession to metric, of course: a 10mm combination wrench. You'll need it, as some of your bike's odds and ends are made outside the U.S. I wouldn't call this a shop-quality tool kit, but that's not the point. You get Essential tools (see how nicely that worked out?) that you can use for emergency roadside repairs of many types. You get a pack to contain the tools, all at a price that's hard to beat -- very hard to beat if you try to assemble something like this on your own. And you'd probably be more upset if your good tools happened to be stolen, too. It's worth a look, anyway. Windzone did a reasonably thoughtful job of thinking this one through.